Elk Crossing - four-bedroom plus two family rooms, 5.5 bath, private home on the new River Golf Course in Keystone Resort. Five private sleeping areas behind closed doors, each with a private bath. Three minutes by car to the ski area lifts. Located in the trees above the Snake River with exceptional mountain views. Easy access to the Keystone Cross Country Center which is also located on the golf course. Lots of outdoor family activities right on site. Acres of open space around the house for snow play and cross country activities. Private hot tub outside. Ideal property for large family groups with the two living areas, each with its own fireplace. Bed Layout (5 private sleeping areas, each with a private bath): BR1 King; BR2 King; BR3 Two Twins (can be pushed together); BR4 Two Twins; Family Room--Twin day bed + Twin trundle bed + Queen fold out (large private room behind closed door; 5th private bath). Main living room--Queen fold out (and portable twin futon--can be put in any room). shower, Private to BR1. Walk-in glass shower; double sinks. shower, Private to Bedroom 2. Walk-in glass shower. Secluded view from this wooded location over the river into the national forest. Seats 12 in main Great Room area (6 at dining table, 4 at side table, 2 at kitchen counter). Also seats 4 more at game table in Family Room. Large deck off main Great Room (overlooks Snake River and mountains). 2nd deck off family room looking north toward Keystone's River Golf Course. Very responsive and made the check in/out process seamless. Would highly recommend staying here again if we are in the Keystone area. We enjoyed our stay at Elk Crossing very much. The house had a well stocked kitchen enabling us to cook meals every day. The house support staff was very responsive when the dishwasher broke down, it was fixed the day we reported the problem. The staff provided us with new knives and spices when we simply mentioned we needed salt and the current knives were dull. Hot tub great. Convenient to Keystone ski area. I highly recommend Elk Crossing. We visit Keystone annually as a family. This year we had 12 adults and kids. We loved the house and amenities. The location and quality of the home were superb! Family was very pleased and had a great time. We just left yesterday and stayed during the blizzard the past few days. This property was outstanding and I highly recommend it. We have 3 adults and 5 children and there was plenty of room for more people. Our group is very seasoned and I can't tell you how awesome it is to have a place that has more than 3 bathrooms and 3 areas to separate after a long day on the slopes. The loft upstairs is incredible. The entire place was an A+, easy to get to Keystone or Dillon. A friend and I have rented condo's quite a bit so we know feedback is helpful, even when you are 100% satisfied. We would stay here again without question, but a few group suggestions. 3. I know there is a light once you go outside on the deck, but one by the hot tub would be wonderful. Maybe we missed it. Overall, to be in Colorado during a blizzard is so beautiful and the house was wonderful and had everything a group would need. 5 out of 5. 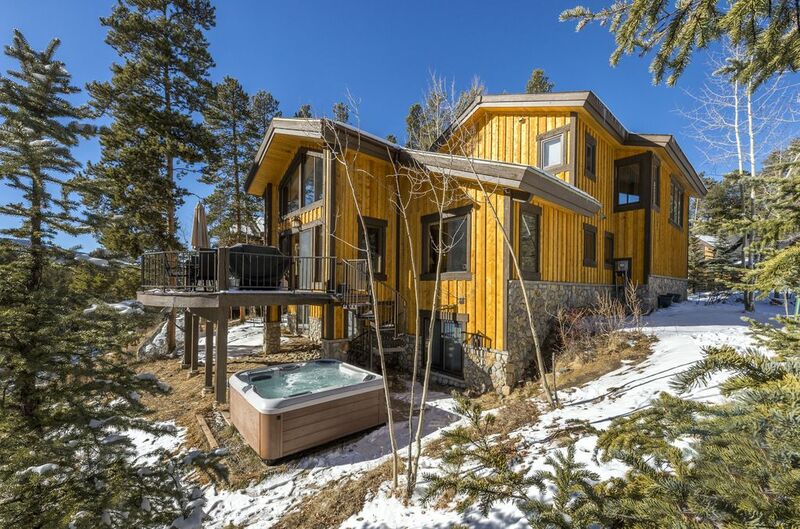 Amazing house--right next to Keystone Resort! We found this house to be unbelievably clean and comfortable! The kitchen was fully stocked with every dish and utensil. Every bedroom has its own bathroom! And the house is just a 3-minute drive from the Keystone ski resort. We loved every minute of our time in this house and will definitely return! Enjoyed the hot tub, fire place, quick access to Keystone, letting the furr babies join as well. One thing please get a pizza pan and pizza cutter. Haha.